Four 12-sheet mosaics are included! Split up your class for a colouring contest, or challenge the class across the hall. 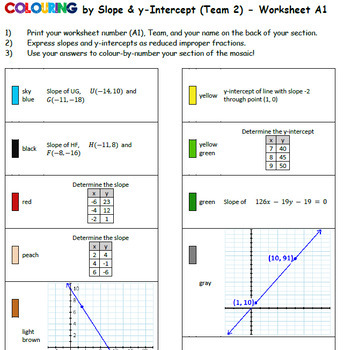 You may wish to require students to find the complete slope-intercept equation for all problems, and show their work on a separate sheet of paper. Check out the product preview to view to know exactly what this task involves! 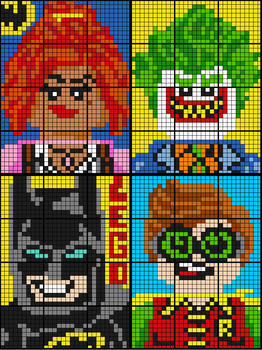 ◾Full class sets of worksheets (12 sheets each) that each combine to create the Lego Batman characters. ◾Problem Order summary, so you know the sequence of problems on the worksheets. 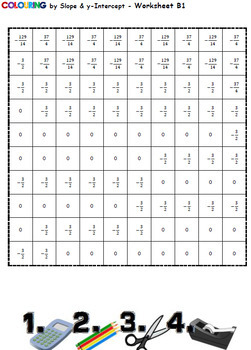 ◾Student worksheets have their answers scrambled at the bottom so they can self-assess their understanding. Thanks for checking this out! Be sure to leave feedback and follow me!